Volunteers rely on Opportunity Coordinators to verify their attendance so they have an accurate count of many hours they've volunteered. The Report Attendance Menu Item in the sharing portal makes it easy to report any attendance that is due. On the page that appears, Once you mark a connection as attended, the hours are automatically updated and attributed as verified hours for that volunteer. 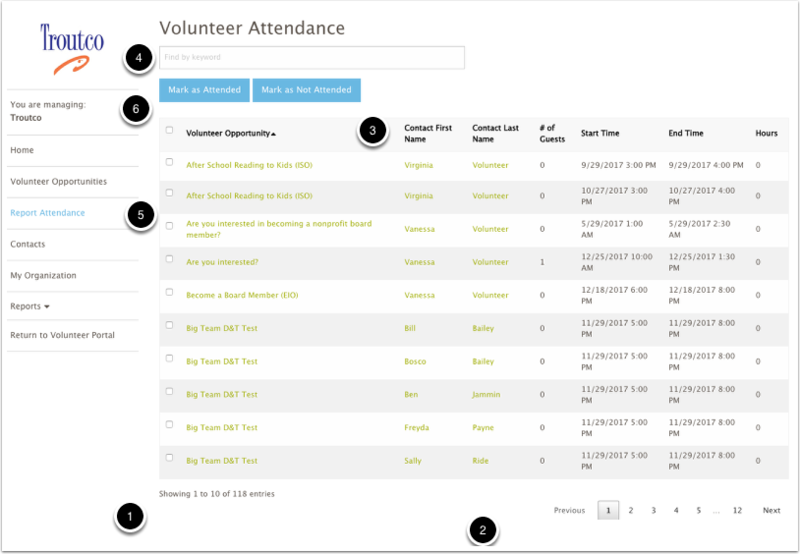 When you click on the "Report Attendance" menu item - you are shown the Volunteer Attendance Grid. The grid lists all connections still in 'please verify' status that have taken place today or earlier. This way you can verify all outstanding attendance in one place. You can also search and verify just specific attendance you are wish to verify. 1. Showing... Shows how many connections are still waiting for attendance to verified. 10 are shown at a time. 2. Previous... Next ... Buttons allow you to scroll through the list of connections, or go to any page. 3. Header fields. Click on any header field to sort the list.Clicking again reverses the sort order. 4. Find by Keyword. Allows you to quickly find just the connections you wish to verify. You can type in a volunteer's name, or the Volunteer Opportunity Name, or a date, and the list will filter to show just those opportunities. 5. To verify a single connection, click on the checkbox to select. You can click multiple checkboxes if you wish to verify several at once - OR if you click on the checkbox in the header row to select ALL of the currently filtered connections. When you click on the "All" checkbox - ALL of the connections that match the selected search/filter will be selected, even if they appear on subsequent pages. Look at the "Showing x to x of X entries (#1) above - to be aware of how many connections you are selecting when you 'select all". 6. Once you have selected one, several or all of the connections in the filtered view - click on either "Mark as Attended" or "Mark as Not Attended" and all the selected connections will be updated. The Hours served will be automatically calculated based on the start time and end time of the connection. The Hours column, before you verify the attendance, will usually have a value of 0. However, if the volunteer has self-reported their hours, the time they have spell-reported for will already be in place. If a person brought a guest - edit the # of connections column BEFORE you mark attendance. If a person volunteered extra hours, you can edit the Hours column to give them credit for extra time. If the start time and End Time are different than what is stated - you can update these fields in most cases (If its a date and time specific opportunity, you can't change the end time to a time later than the scheduled end time. In that case - adjust the hours instead. To edit any of these columns, hover over the column and a small pencil and paper icon will appear. Clicking on it will allow you to change the value in that column. After you make the edit, click the SAVE button on the top of the page to save your edit. You can edit multiple columns before saving. The edits you're preparing to save appear in red (7) until you save them. You can undo your changes by clicking on the undo icon before saving. (8). Click on the Save button (9) to update the connection. After you've made any edits you wish to make and clicked on Save, you can then go ahead and mark the connection as Attended or Not Attended. Once you've marked a connection as attended or not attended, it will no longer appear on the report attendance page. You can however, update the connection subsequently by finding the connection via either the Volunteer Opportunity Page or the Contacts page. Here's how to easily take the check-in sheet you've printed for an individual occurrence, and, if you've used it to check-in volunteers for an occurrence on paper, then easily report it on the 'report attendance page"
1) Use the keyword search box to put in the date of the occurrence, or the opportunity name. This will limit the connections to that one occurrence.